The name Patrick Scannell has become so synonymous with St. Mary Gate of Heaven School, Ozone Park, that it’s difficult to mention one without the other. 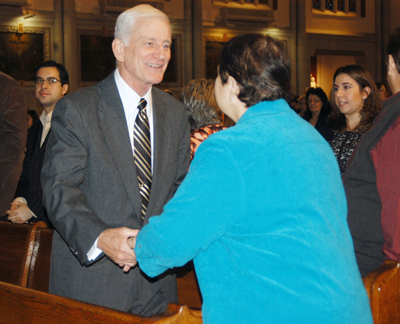 That wasn’t a problem at St. Mary Gate of Heaven Church last Saturday, Oct. 27, when the parish and school community gathered for a Mass of thanksgiving to honor Scannell’s 45 years of dedicated service as a principal and teacher in the school. A festive brunch followed at Russo’s on the Bay, Howard Beach. Among those present were former teachers, like Patricia Elliott, who taught with Scannell in the 1970s; present teachers who were his students, including Patricia DeMarinis; former students, like Ryan Sewnauth and John Dall’aglio, as well as current students and their families. Several Daughters of Wisdom, who administered the school before Scannell, including former principals, Sister Virginia Marie Dunn, D.W., who hired Scannell, and Sister Lucy Clynes, D.W., his immediate predecessor, were present to congratulate him. 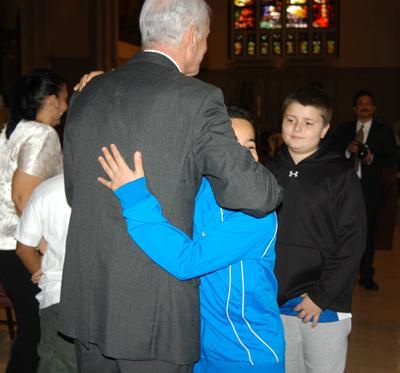 Corso was in third grade at Gate of Heaven when Scannell became principal. 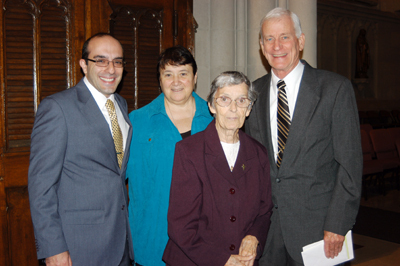 In his homily, Father Gerald Fitzsimmons, S.M.M., pastor, spoke about that legacy – the “fidelity and life-giving love that has been poured out by God through Pat Scannell.” His words prompted a standing ovation for Scannell, who patted his eyes with a handkerchief. Born and raised in Our Lady of Mt. 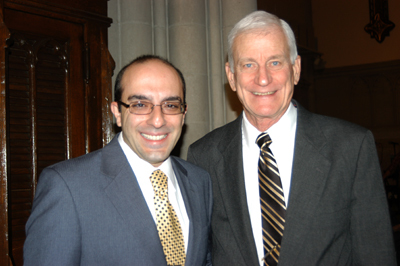 Carmel, Astoria, he attended the parish school and went onto Cathedral Prep Seminary, Brooklyn, where he played basketball and discerned a vocation to religious life. His formation continued at Christ the King Seminary at St. Bonaventure University, Olean, N.Y., where he earned a bachelor’s degree in philosophy. When Sister Virginia Marie Dunn, D.W., then-principal, hired him, he became the first male teacher in the school’s history. He taught social studies, science, reading and religion in the upper grades for the next 17 years. He continued his own education as well by earning a master’s degree in education at Hunter College, Manhattan, and a professional diploma in administration and supervision at Fordham University, N.Y. When Sister Lucy Clynes, D.W., left her post as principal, the pastor, Father Peter Ballenger, S.M.M., asked him to consider taking on the responsibility. Scannell accepted and so began his 28-year tenure as principal. His blue eyes teared up as he recalled one boy, in particular, who had leukemia. The child became sick one morning in the schoolyard, Scannell said, but when the bell rang, the boy marched into the building with his class, never letting his illness get in the way of his education. “This kid had it tough, but his courage and dedication inspired me,” Scannell said. Although it’s been hard to leave, he recognizes that his energy level is not what it used to be, “so it’s time to move on,” he said. Outside of the classroom, Scannell has been a parishioner at St. Mel’s Church, Flushing, for the last 41 years. He has been an avid runner and is proud to have eight N.Y.C. Marathons under his belt – all of which he completed in his 50s and 60s. In his retirement, Scannell plans to stay active and visit relatives – his brother in Iowa and sister in Florida, and perhaps even his cousins in Ireland. But there’s no doubt he’ll remain a presence at the school, where he’s invested so much of his life that a scholarship fund has been created in his name.